Pioneers in the industry, we offer waist bag and folding elastic woven from India. We are offering Waist Bag to our clients. Backed by a team of highly skilled professionals, we manufacture and supply a varied range of tapes in varied sizes and dimensions as per the requirements of our clients. 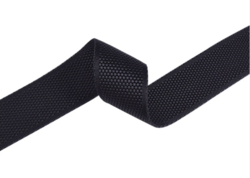 We are a remarkable entity, engaged in offering a superior quality range of Folding Elastic Woven. Yarn-dyed 100% colorfastness with good rubber quality, suitable to use for bag pack bottle holder edge binding.